Walsine Pierce: CHRISTMAS SHOPPING 2009: All Done! It's December the 4th and my Christmas shopping is complete! Oh, I may stir a bit of apple butter and do a little Santa-ing for the wee ones, but, beyond that, I'm home free! Sure, we'll have a few friends & family in for a holiday dinner or two and we'll surly go to Kimberly's family gathering, but shopping is done for one more year. Hurray! Shopping is just not one of the things I enjoy, unless I need a nap or have a good book. I will go with Julie for groceries and such. I drop her off and pick her up at the door. Then I park close and nap until she shops her heart out. In Myrtle Beach, if there is no one else around, I will go to Broadway-at-the-Beach with her. I go to the Old Country Store, sit in a rocking chair on the porch and read. I am not what you might call a "shopper". I have been known to sneak off to Johnny Rockets for a hot dog. I do, however, love to give gifts! I am just like my Dad, I can't wait. Truly, giving is much better than getting. Today I went shopping for family and close friends. Its all done. I feel so good about it. Where did I go shopping? Why, to my home office, where else. What did I find in the office? A great, proven, popular gift for everyone. A week, or more, at the beach, all expenses paid. Just get to Myrtle Beach in October and enjoy a week in a luxurious, pent house suite at the Royal Garden Resort in Garden City, SC. We have enjoyed this homey resort 18 times in the last 21 years. Our children, their children and their and our friends have all come down to enjoy a week or so every year. We always welcome their arrival the same way: Taco Salad Dip with Chips, a hearty Corn Chowder with Corn Bread and a freshly baked Apple Pie. This has become the traditional welcoming feast. Unable to make a long trip by car, on our last visit Julie flew down for a couple weeks only. It was so lonely after I took her back to the airport that I said I'd never do that again. But, we have missed it so much. A month a year for 18 years really makes that part of our life. The kids and friends have missed it too. 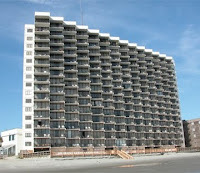 So, by faith, I have reserved the pent house suite for the month of October 2010. Rental on this penthouse suite--a key required to reach it by elevator--goes for around $800 a week in season. We have been there in season. It was hot, crowded, expensive and not a lot of fun. In October the weather is perfect, except for the two years there were huricanes, the beaches were empty, restaurants and stores weren't crowded and everything was cheaper. Most important, I can pay for a month out-of-season lease by simply sending them a hundred a month until October. When it is time to go, the bill is already paid. Sweet! We load the car down going and coming. I'm not sure why but food is extremely expensive there. We take enough food to entertain for a month when we go. We still spend money for fresh bread and lunch meats, etc, but mostly we take everything with us. One year I told Julie we'd just buy tomatoes down there. While people will give you tomatoes in Ohio in October, a small basket in Myrtle Beach cost $25 and we use a lot of tomatoes. I still get kidded about that bad decision. While we're there Julie and the family goes Christmas shopping at all the outlets. There is hardly room to sit in the car coming home. In addition to what Julie buys we also haul home gifts for those who fly down and back. Being crowded with packages has become part of the fun. ENTER INTO SUITE 1604 AND ALLOW ME TO GIVE YOU A TOUR OF WHAT HAS BEEN OUR OCTOBER HOME FOR MANY YEARS. (Click on pictures to enlarge). The resort is impressive as it is approached from landward. 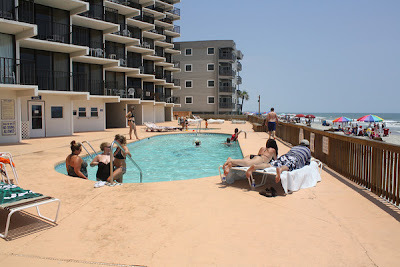 It is located right on the beach, in fact the ocean comes around the deck at high tide. Being 16 floors up, we get a great view all around, but it takes a bit of doing getting used to the height. Perhaps it is even more impressive as seen from the beach? We love playing bocci ball on a sand court. The kids all enjoy the ocean but I haven't been in it for years. I do enjoy making flowery messages in the sand early in the morning. We are in the middle of the top floor. The living room is large with two couches and comfortable chairs. They have added a large flat screen TV since we were there last. 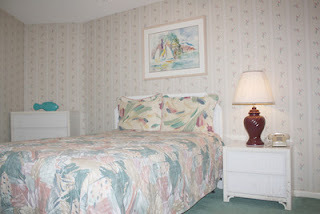 They have also refurbished the entire suite replacing darker wall paper with light colored paint. I like it better. On the balcony you can see forever. The far away lights are lovely at night as is the moons reflection all the way to the horizon on the ocean. 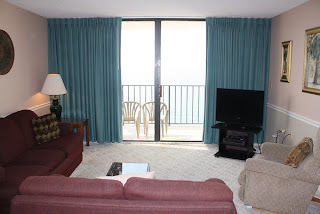 My son-in-law, Jack, likes to sleep on the balcony and Mark and Mary like to sleep on the sofa bed with the sliding doors open listening to the surf. We do cook. We cook a lot! I like to cook although Julie is a better cook. The kitchen is very efficient. I do breakfast. After about the 3rd morning everyone starts to groan. Don't know why as they always eat it up. Guess they are thinking how hard it will be to rid themselves of all those calories. UMMM. Julie does a London Broil Steak one night and Spaghetti and Meatballs another night. I always broil Strip Steaks one night. We bring these seasoned steaks from Bennett's Fine Meats in Canton, Ohio. Perhaps the best night of all is Finger Food & Game Night. Yes, we eat out a couple times a week. There is a 4th bath in the entry way also a laundry room. The latter is very important for a month's stay. Linen and towell service is encluded in the lease but there is always a lot of other laundry to do. There is a trash chute next to the elevator. Julie and I take the Master Bedroom as we are there for the entire month. We have moved out a time or two but moving our clothes and stuff is a bit of a chore. Also this bedroom is next to the entry and we can get in and out early and late and not bother others. It has a window looking landward. The second bedroom has two queen sized beds. The third bedroom has a full sized bed and a twin bed. Add the sleeper sofa and we can sleep a crowd. At times we have even put people on the floor on air mattresses. What fun that was. There are lots of closet space. Each bed room has it's own bathroom. 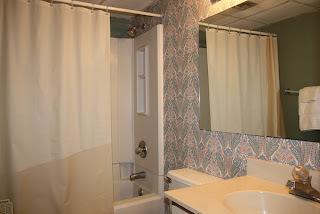 This is the bathroom in the master bedroom. 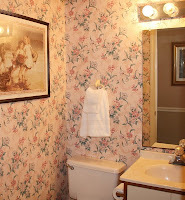 With all the eating we do, all four bathrooms are needed. One bath room like we have at home would never work for the crowds in this house of fun. 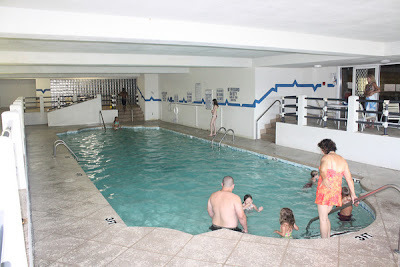 SWIMING POOLS? SURE! INSIDE AND OUT. 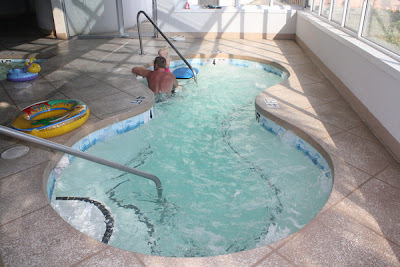 WHIRL POOL HOT TUB? YOU BET'CHA! 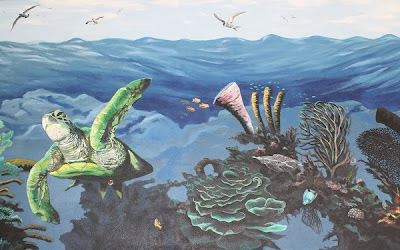 THERE IS A LOVELY MUREL PAINTED JUST ABOVE THE HOT TUB. BEACH SIDE SUNNING DECK? ISN'T IT A BEAUTY? WHAT MORE CAN I SAY EXCEPT "MERRY CHRISTMAS" AND PLAN TO "COME ON DOWN"! Kids and I can't wait! !